JCH Seamless Gutters inc., is a company who cares about their customers and the quality of the product that they install. These products will not rust and cannot burn nor will they split or crack due to cold weather. 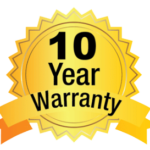 We offer a 10 year limited warranty on workmanship and a 20 year limited warranty on material. Warranty is null and void if repairs are attempted by anyone other than JCH Seamless Gutters inc.
What does the 20 year warranty cover? This warranty ensures that the paint will not peel, flake, or blister under ordinary wear on the gutter. When called JCH Seamless Gutters inc., will send a representative to assess the problems with the gutter/downspout. The homeowner must be present to show our representative what the problem is. Our representative will come to a conclusion and tell the homeowner what steps will be taken to remedy the problem and schedule repairs if necessary. JCH Seamless Gutters inc., shall, at its sole option either repair, replace, refinish or refund any defective materials.